Fit Fluential Mom: Get Your Kids To WANT To Do Their Chores! 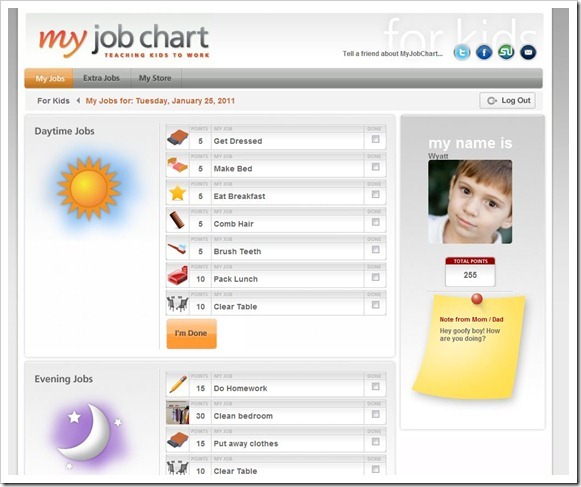 Check out My Job Chart & Motivate Your Kids to Do Their Chores! Ok parents, here’s a subject most of you will be very familiar with….getting your kids to do their chores!! Not only does this help you out around the house but it also teaches them responsibility, organization & how to take care of themselves and their belongings. I recently came upon a website that provides parents and kids with an amazing tool to motivate your kids to do their chores!!! 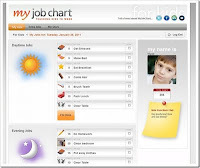 My Job Chart is a free, easy to use, online chore chart and reward system. It motivates your kids to get organized and teachers them first hand how to save, share and spend. And it does ALL of this for FREE!! It makes it easy for parents to assign chores and more motivating and meaningful for children to complete them. All you do is register with the site and get your family registered as well. Then you assign jobs, set the rewards you desire and encourage your kids to get started! You can set morning and evening tasks for each of your kids to complete and designate a point value for each one. Tasks can be as simple as "Brush my teeth", "Eat my veggies", etc or "Clean my room", "Take out the trash". etc. After they’re completed, kids earn points to either save, give to charity or buy more rewards you set! You can keep track of what they accomplish and get notification of when chores are done too! My daughter is still a toddler so we are working on chores but she’s too young for this technology on her own. I am doing it with her so that, when she’s old enough to get on the site on her own, she’ll be used to it and loving it by then! Check it out at http://www.myjobchart.com.